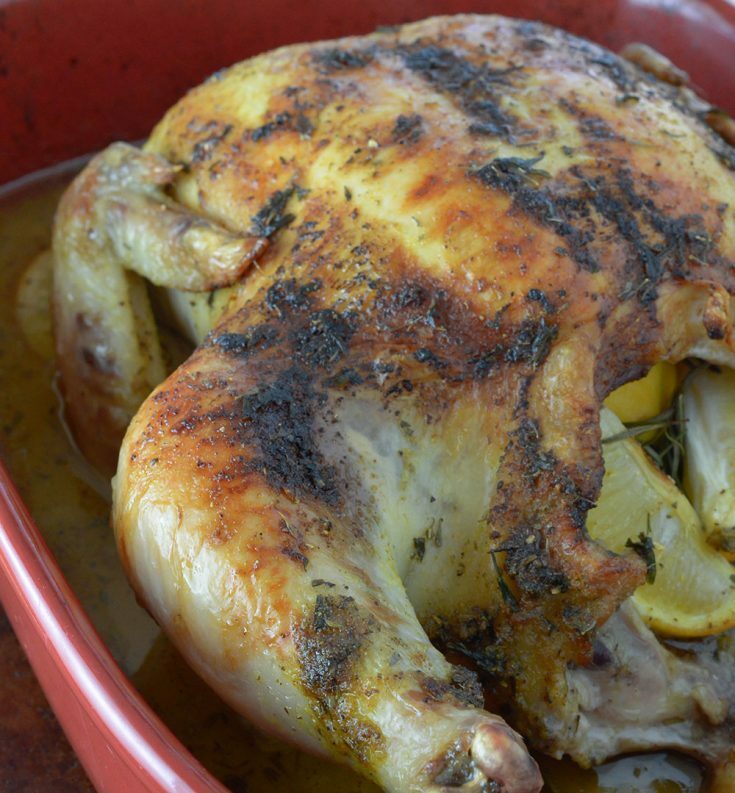 This Oven Roasted Chicken Recipe with Lemon and Rosemary is easy and versatile. Serve as a dinner main course or debone and use in any of your favorite chicken recipes. Makes great leftovers! 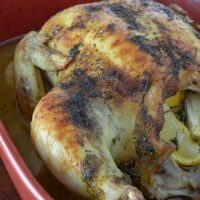 A whole roasted chicken is definitely one of my go-to comfort meals. Eating it for a dinner is great. But really I enjoy picking at the chicken cold from the fridge. Or even better, using the leftovers for a sandwich, tacos or to make chicken soup. 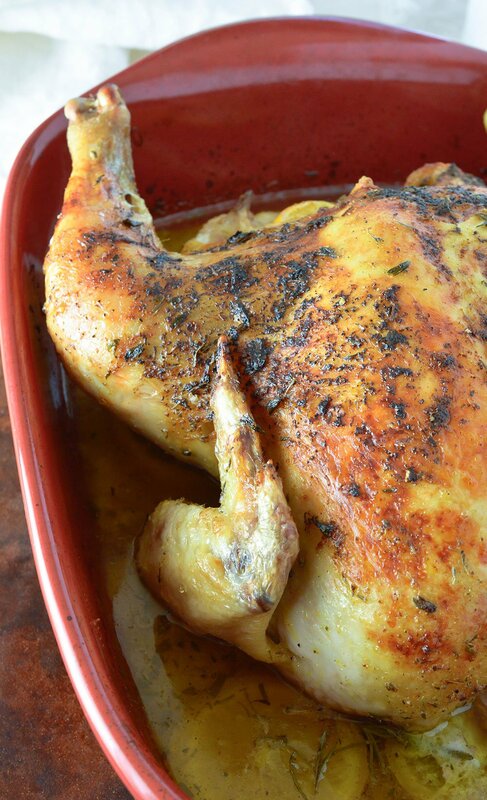 This Oven Roasted Chicken Recipe is also perfect to bring to a friend in need of comfort food. For a grieving family, recovering friend, new parents or just someone going through a rough time. It’s hard to know what to do or say when someone is hurting or going through difficult times. I’m not good at emotional stuff so I tend to act instead. Bringing loved ones a comforting meal is a great way to show your love and support. I’m joining a group of bloggers to show support for our fellow food blogger, Ashley at Centercut Cook. Ashley’s husband, Ryan was diagnosed with Stage 4 colon cancer at 29 years old. This was right after Ashley learned that she was pregnant with their first child. Devastating. Then after Miles was born the unimaginable happened. He had a seizure and and after numerous tests Miles was diagnosed with a rare disease called Primary Hyperoxaluria (type 1) and will need a life-saving liver and kidney transplant. How can a young family deal with so much? They are so strong and positive. It is amazing. There is a way we can help and show our support. Through a fundraising effort to help cover the insurmountable medical costs incurred by cancer treatments and organ transplants. Remove giblets from inside chicken. Rinse and pat chicken dry with paper towel. Place chicken on top of sliced lemons, breast side up. Mix olive oil, juice of 1 lemon, salt, pepper and chicken seasoning. Pour mixture over chicken and rub in to ensure entire chicken is coated. Sprinkle with more salt and pepper. Cut remaining 2 lemons into wedges and stuff inside chicken along with more rosemary. Roast for 1-1½ hours. 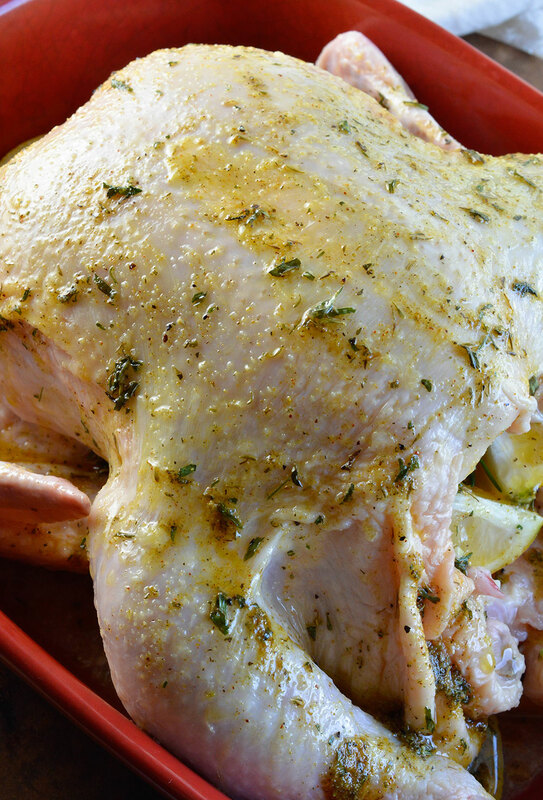 Until legs wiggle loosely, juices run clear and/or a thermometer reaches 165° in the thickest part of the thigh. Slice and serve chicken. Drizzle a bit of the pan drippings over chicken. **A little rosemary goes a long way. Use it sparingly. Thanks Liz! I’m so glad I could be a part of this fundraiser as well. This chicken is mouthwatering. I could totally see myself making this for my family as a weeknight meal. Prayers for the Wagner family in this difficult time. These are the two ingredients I love! Rosemary and lemon. These two both give out strong scents and wonderful flavors! It will be perfect for a roasted chicken. This dish is just so mouthwatering! Me too! Lemon is my favorite.